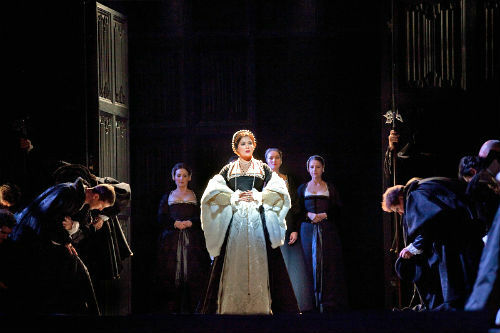 The Metropolitan Opera debut of Donizetti’s Anna Bolena, an amazing 180 years into the work’s history, won mostly respectful reviews last week—in between snipes at Anna Netrebko’s momentary breaking of character during the “Tower Scene.” A common thread in both published and popular opinion, though, was that the piece itself was not very interesting, at least absent a Maria Callas or Edita Gruberova to kick a little life into it. It’s hard to argue with taste, but possible, I think, to propose that the perceived longueurs of the opera are not integral to the work but rather a function of the way it was presented. It’s become a cliché of faint praise to say that a director “took the show seriously,” as if everyone’s first reaction to an opera would naturally be to send it up. And the lazy critic’s favorite adjective is “handsome,” descriptive of any production that doesn’t feature actual vomit as a design element. Yet “serious” and “handsome” are about the most complimentary things you can say about the Met’s production by David McVicar. The sets (Robert Jones) revolve around two sorts of three-dimensional walls: weathered gray brick and weathered gray wood paneling; costumes by Jenny Tiramani are archeologically correct 1530s silhouettes interpreted in stiff black and gray silks. The monochrome is interrupted by the odd soloist’s costume: a claret velvet riding habit for Anna, for example, or a canary-gold brocade doublet for the king. The lighting (or as the old joke goes, “the obscurity”) by Paule Constable remains flat and bone-colored even in the drama’s one exterior scene: it’s overcast outdoors and in. 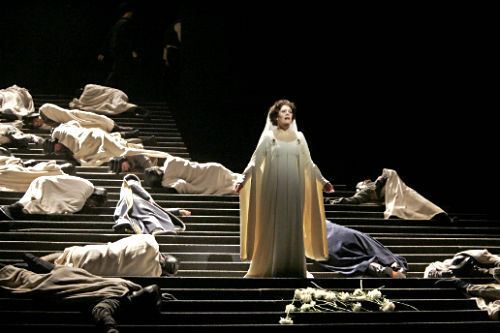 Now, production design based on monochrome need not be dull: think, for example, of the recent Atys at BAM, or, farther in the past, the John Dexter/Josef Svoboda staging of Les Vêpres siciliennes that premiered at the Met in 1974 and was revived as recently as 2004. 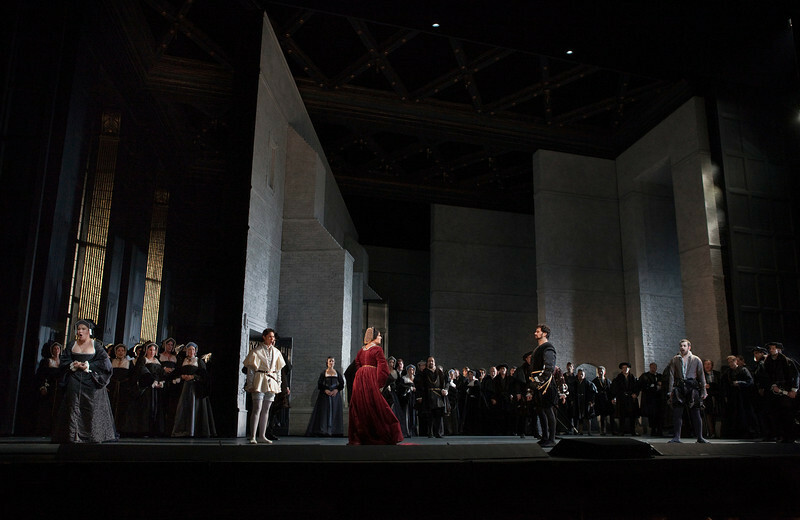 In contrast, Anna Bolena is a very unified score with little in the way of light relief: even Smeton’s ditty in the first scene has a dramatic purpose. The tone is further darkened by keeping the prima donna’s vocal line fairly low, in her veiled middle register. Now, even a dour Anna Bolena arguably might make sense in the context of a scholarly presentation of the work, in connection with some conference on Donizetti performance, or even in a theater with a history of presenting the opera: having heard the work done many times in various ways, for a change to see the “dark” Bolena. But this was the Met premiere of a nonstandard work, and, what’s more, the occasion was more than just a simple production premiere. It was also the opening night of the opera season, a social and cultural event regardless of the caliber of the onstage performance, and—this doesn’t happen every year, of course—this evening celebrated the ascent of Netrebko to the status of company prima donna, the coronation of a star. What was lacking on so special an occasion was glamour. Now “glamour” is a bit of a dirty word in the arts: the very term originally meant a magic spell that distorts the victim’s perception of the real word. Specifically, a “glamour” made something mundane or even ugly seem exotically beautiful. Thus in its very origin glamour is a sort of lie, a trick, and therefore not suitable to art, which is supposed to be dedicated to the revelation of truth. Opera, as a collaborative form that is forever struggling to wed high art to popular appeal, lends itself perhaps all too readily to glamour. The stories are almost invariably set either in a romanticized past or some vaguely-understood exotic land like Persia or China or California, and even the default image of an “opera diva” is very much in mold of that avatar of Hollywood glamour, Elizabeth Taylor: big hair, big bosom, tiny waist, lots of paint on the face, and glitter everywhere. For more than 40 years, while Franco Zeffirelli reigned as fairy godfather to the Met, every production with even a pretense to fanciness had to ladle on the spangles and velvet drapes. Even non-Zeffirelli stagings gradually tarted up over the years. When the Marschallin (Leonie Rysanek) climbed out of bed in the 1969 Merrill-O’Hearn Rosenkavalier, she slipped into a simple mauve chiffon peignoir. Forty years later Renée Fleming was upgraded to a peachy-gold lace confection heavily reimbroidered in iridescent beads: a smashing evening look perhaps, but surely overkill for a quiet breakfast à deux. Since Zeffirelli took his official leave from the Met in 2008, the company has experienced—some would say suffered—a backlash against glamour, or at least against those qualities that, thanks in part to Zeffirelli, are wrongly perceived as the synonyms of glamour: triviality and meretriciousness. Thus, McVicar’s resolutely post-Zeffirelli Anna Bolena: accurate in period detail, certainly not cheap, but scant on glamour. 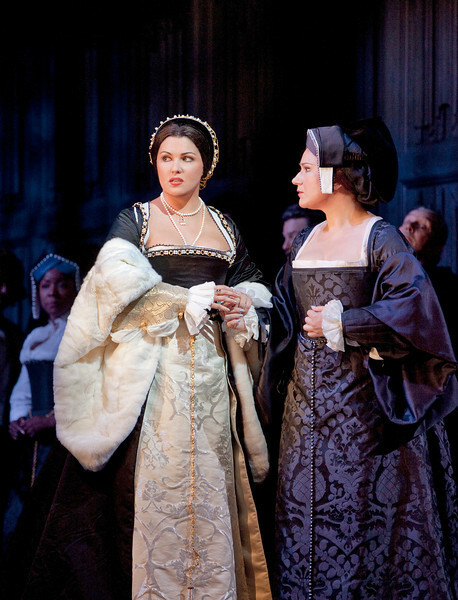 The court of Henry VIII appears positively Puritan, and, what’s worse, leading lady (and presumpitive Queen of the Met) Anna Netrebko is made to look matronly. “Handsome,” that awful word, comes to mind again. Who wants a handsome diva? 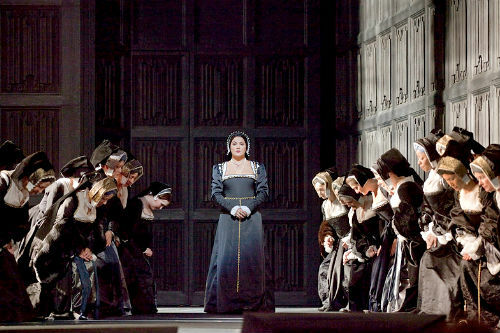 On a less frivolous note, the story of Anna Bolena is bent a bit out of whack by the relentless severity of this production. In very first scene, the queen enters, expressing a vague sense of unease: “Afflitta, è ver son io… / nè so perchè… Smania inquieta, ignota / a me la pace da più giorni invola.” No, there’s no immediate threat, only… something’s not quite right. As the saying goes, a cloud has momentarily passed over the sun. But McVicar keeps his gaze firmly fixed on the cloud with never a glimpse of sunshine, either figuratively or literally. The opera opens in almost total darkness, with most of the court in funereal black. Anna enters, backlit, and as she becomes more clearly visible, we see her dress is also black, though with lots of bulky white fur and brocade trim. The effect is heavy and unflattering: she looks not so much gowned as upholstered. But instead the queen just goes from grim to grimmer. Even a brief flirtation with color later in the act isn’t much of an improvement. True, this dress is red, but such a sober, mature red, and look at the cut and the fit. Oh, I’m sure the pattern is very authentic, but the very deep trapezoidal neckline combined with the slightly raised waistline (emphasized by the tightly-drawn chain belt) makes Netrebko’s torso look short-waisted and shapeless. Heavy sleeves, again with massive fur cuffs, further widen the silhouette at its midpoint. The French hood headdress (which apparently the real Anne Bolyen favored) lies quite close to the head, with the hair parted and dressed flat, the back confined into a snood. The contrast of the tiny head and blocky body is ungainly, certainly unflattering for Netrebko. She doesn’t look pretty or charming, let alone fascinating; in a word, she’s not glamorous. Further, how much more more striking would be Anna’s simple black shift in her prison scene if we had the contrast of “happier” gowns earlier in the evening. Of course, that would require a different sort of sensibility than what McVicar brought to this project: after all, the big elevator “reveal” for the prison scene replaces a gray brick wall with… a slightly different gray brick wall. It’s as if McVicar is determined not to let the audience have any fun. His drab aesthetic is just the sort of thing one of history’s foremost experts on glamour, Diana Vreeland, rejected: “We all need a splash of bad taste — it’s hearty, it’s healthy, it’s physical. I think we could use more of it. No taste is what I’m against! 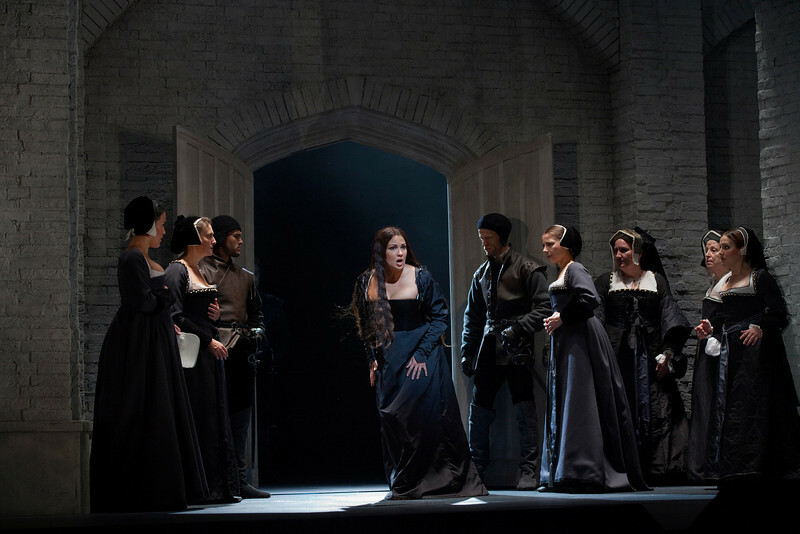 The lack of glamour exemplified in this Anna Bolena seems to be the standard at the Met moving forward; Peter Gelb apparently doesn’t trust anything too pretty. The question is: will audiences buy into his “no bad taste” aesthetic, or will they simply be bored? That distinguished music critics and avid fans alike complained that Anna Bolena was overlong or dull is not an encouraging sign. 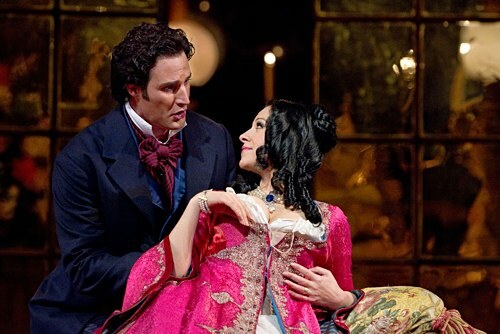 Photos: Vêpres and Anna Bolena by Ken Howard; Traviata by Marty Sohl. This entry was posted on Saturday, October 8th, 2011 at 2:40 pm	and is filed under Rough and Regie. You can follow any responses to this entry through the RSS 2.0 feed. Both comments and pings are currently closed.